While relations between their countries may be at an all-time low, Indians and Pakistanis who marry each other often find extended family ties confound their nations’ mutual hostility. It is a truth universally acknowledged, that when two South Asians wed, they not only marry each other, they also marry into each other’s family. And family matters between Indians and Pakistanis might be expected to be highly charged, given those two countries’ mutual antipathy for more than 60 years. “When an Indian marries a Pakistani, it’s a loaded event that can only be matched by the energy of a cricket match between the two countries,” says Amra Hyder, a Pakistani. 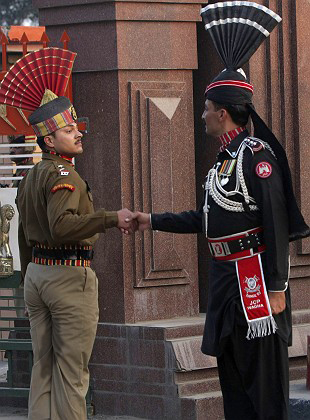 The partition of British India into Pakistan and India is historically recorded as the largest human migration ever. It displaced millions and forced people of a common culture to choose a new geography and subscribe overnight to the idea of previously non-existent nations. Most tragically, it split families. The ghosts of the 1947 partition loom large in the psyches of both countries’ modern histories that include three wars, a continuing dispute over Kashmir and terrorism. Amra is originally from Pakistan and is married to Zulfiqar Hyder, who hails from India. 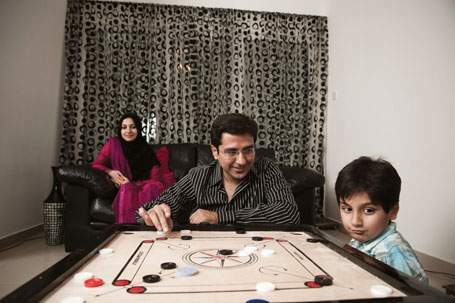 Amra and Zulfiqar, now Canadian citizens, have lived in Sharjah with their four children since 2006. In 1992, when the gregarious, romantic 23-year-old Amra married the 33-year old Zulfiqar, a studious man from India, she did not quite know what to expect – from married life, her in-laws and most importantly, her husband’s country. “I also never would have imagined I would be apologetic for both countries’ ridiculous obsession with ‘Shonia’,” she says of the media brouhaha over the recent nuptials of the Pakistani cricketer Shoaib Malik and the Indian tennis player Sania Mirza. For long before the Malik-Mirza marriage, thousands of Indians and Pakistanis, mostly from families divided by the 1947 partition, have been marrying each other. The difference is that now these marital alliances are formed outside the extended family circuit. Amra and Zulfiqar did not have an arranged marriage, and neither of them had any intention of settling in either India or Pakistan. They opted to overcome predictable visa hassles by initially residing in the UAE soon after their wedding, and migrated to Canada in 1996 to obtain citizenship, in the hope that it would ease their trips between India and Pakistan. Amra grew up in Abu Dhabi and returned to Lahore for university. Her childhood perception of Indians was to lump them all as people from the Southern Indian state of Kerala. “It was so wrong,” she says regretfully admitting to an error of judgment on her part, “but I honestly never really gave it any thought.” Although her grandfather was an active political leader – initially in the Indian independence struggle and later in the Muslim League, which pressed for Pakistan’s creation – she was uninterested in matters of politics. On numerous trips to Northern India in the last 18 years, Amra has returned amazed by the cultural similarities she has observed between Indians – including non-Muslims – and her community in Pakistan. “We speak the same kind of language, we appreciate the same food, we like the same clothes, we place the same importance on family values. We even share similar pre-wedding festivities. It’s hardly an alien experience,” she says. Amra and Zulfiqar’s children – Hira (17), Anum (13), Zahra (11) and Ali (10) – describe themselves as desi, a generic, originally sanskrit, term used by South Asian immigrants that loosely denotes their origins. They are an animated group and debate the definition of desi among themselves, as their parents look on proudly. The conclusion: among younger generations in urban settings, desi communities have spawned a culture bound by a fondness for Bollywood, cricket, South Asian food and fused elements of their upbringing at home with the globalised, western outlook they are exposed to outside. Having said that, India and Pakistan enjoy enormous cultural riches – largely attributable to their ethnic, regional and linguistic diversity. Both countries together are akin to the European Union – with each of their provinces having their own quirks, tastes and sensibilities. These subtleties within communities are apparent when embedded among the people in their own land. Masooma Syed, an artist from Lahore, lives in Delhi with her husband Sumedh Rajendran, also an artist, but from the south of India. 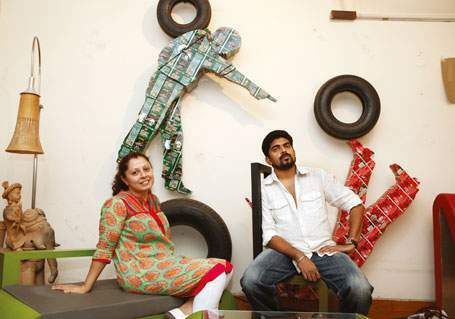 They were introduced to each other at an artists’ residency programme in the Indian capital Delhi in 2003. Following that, they would arrange to meet in Manchester, Sri Lanka and New York before finally geting married in July 2008. Their cultural backgrounds could not be more different, as are their temperaments and artistic styles. “And yet, I knew he understood me perfectly,” says Masooma of the decision to marry across the border and step into the cumbersome world of visas, soon after exchanging wedding vows in Sri Lanka. Kerala, where Sumedh is from, however, is an altogether different milieu. “The first time Masooma visited, she was stunned,” says Sumedh. “I thought to myself, how lucky am I to be able to see and discover these different facets of India,” she says recalling her reaction to the abundant greenery, the aromatic spices, the swaying coconut palms and the simple people. Masooma has been visiting India since 2003 and as an artist she has travelled, exhibited and worked in both countries. “I go through the same motions as all Pakistani nationals applying for an Indian visa. It’s a process and is easy or difficult depending entirely on how you want to look at it,” she says. In early June, the Indian government announced it was relaxing the requirements for granting the extension of long-term visas to four categories of Pakistani nationals, including Pakistani women married to Indian nationals and staying in India. The announcement was welcomed by individuals in her situation. Her current visa is a ‘visit visa’ valid for nine months that is split into three visits of 90 days each. She has to exit India after each ‘visit’, but says it suits her work commitments that require her to travel abroad. “And I can visit my family in Lahore,” she adds. Pakistani nationals issued visas to India are typically allowed to visit a maximum of three cities and must report to a police station on arrival and before leaving for their next destination. Masooma is now exempted from the police reporting, as she is a regular traveller between India and Pakistan and is also now married to an Indian national. “I’m allowed to visit more than three cities each time, but it will be a while before I am given complete freedom to travel like any other foreigner,” she says. She could apply for a residence permit, but would be compelled to stay in India until the paperwork is completed, but it’s diffiuclt to predict how long that would take. Nationality, however, remains a touchy issue, particularly among the educated and liberal women of either country, who see no reason in giving up the passport of the country they originally belong to. “Unfortunately, political relations keep changing and this spills over into visas and affects people-to-people relationships,” says Zulfiqar Hyder, a staunch believer in encouraging contact between the two countries. The Hyder family hold Canadian passports, but they still have to apply for visas to visit India and Pakistan. In the wake of the David Headley arrest – a US citizen of Pakistani origin – over his alleged terrorist connections and involvement in the 2008 Mumbai attack, Zulfiqar says having the Canadian passport makes little difference towards easing the process. “I’m trying to get a PIO (Person of Indian Origin) card for the children,” he says of the document issued by the Indian government that functions as a long-term multiple entry visa. As things stand, the foreign spouse of an Indian national is eligible for the PIO card, but the spouses from Pakistan are not, effectively ruling out Amra and her two elder daughters, as they were previously travelling on her passport. “I don’t understand the logic that my children cannot get the PIO card, because their mother is Pakistani,” says Zulfiqar. They arrived by night. Across the Arabian Sea, first on a small boat, then a hijacked fishing trawler and finally entered Mumbai’s waters on a rubber dinghy. Visa-related policies in both countries are updated depending on the warmth or frostiness of the political relationship. Shadab Raza, a 35-year old Indian also from Lucknow, married Pakistani national Sana Zehri, who grew up in the UAE. They have a six-year-old son who has an Indian passport. 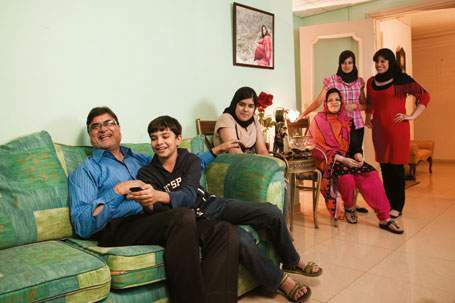 The families arranged their marriage, as Shadab’s maternal aunts live in Pakistan. “There’s never been this India-Pakistan mentality in our families, because we have relatives on both sides of the border,” says Shadab. Sana’s ancestry can be traced back to Lucknow, as her grandparents migrated to Pakistan at the time of the partition. On her first visit to the city after her marriage, she visited the ancestral home of her grandparents and filmed it to share with them. “I filmed the house, the neighbourhood and some of the people recorded messages for them. When they watched the video they were consumed by nostalgic sadness. I think partition hurt their generation the most. Our parents to a lesser extent, but they still feel the impact of it as they grew up hearing about it from their parents and visiting immediate relatives in the other country. For my generation, the degree of the trauma is even more reduced, because we haven’t experienced much of the consequences of it directly,” she says. Shadab and Sana’s son, Ali, however, is quite clear about where he is from. “India,” he says firmly. Sana laughs and recalls an incident of him wanting a carrom board specifically ‘made in India’. “My father-in-law had to get the lettering customised because the shop, where they bought it didn’t sell carrom boards with a ‘made in India’ label,” she says. In the meantime, Ali brings out his carrom board and empties out the coins from their container. He then calls out to Shadab to come and play with him. “There’s never been this India-Pakistan mentality in our families, because we have relatives on both sides of the border,” says Shadab sitting down at the board, across from Ali, who flicks the large striker coin towards the arrangement of smaller black and white coins stacked by colour in the centre of the board. The two towers collapse, some of the coins disperse in four directions, but none of them is pocketed. “What a mess,” exclaims Ali. Pakistan’s stellarly good-looking tennis champ Aisam-ul-Haq Qureshi became the first Pakistani to reach the quarter-finals at Wimbledon when along with his Indian partner Rohan Bopannahe beat Lucas Lacko of Slovakia and Sergiy Stakhovsky of Ukraine in straight sets in the Mens’ Double. Their straight set victory – 7-5, 7-6 (7-4), 6-2- in the Round of 16 now take them to the Mens’ Doubles Quarterfinals, and already place them in the top-8. But Pakistani Aisam-ul-Haq Qureshi and his doubles partner Rohan Bopanna from India are also attracting a lot of attention for where they come from, and what they are doing together. 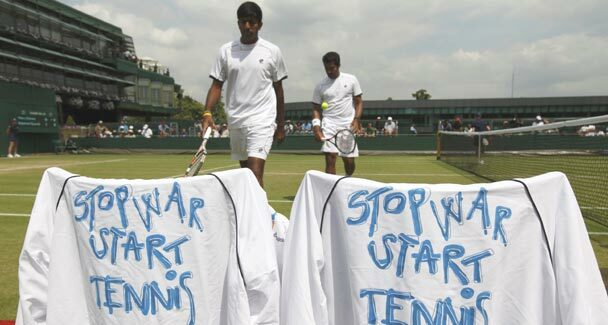 The unlikely Indo-Pak pair have been playing as one team and they have been sporting tennis jackets that say “Stop War Start Tennis.” Now they have suggested a novel idea of a tennis match played at the Wagah border. The world is not used to seeing India and Pakistan step onto any field as one team so the unlikely duo have been making headlines. And they are making full and good use of it by promoting the game of Tennis in the cricket dominated subcontinent and spreading the message of peace. 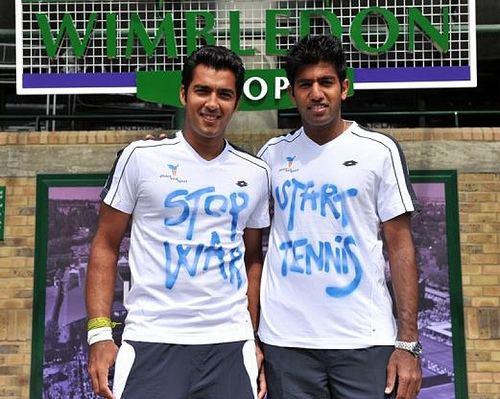 Aisam and Rohan met at the age of 16 at a tennis camp and they have been good friends ever since. They are a good example of how friendship can overcome barriers or race, religion and nationality. While their international tennis playing status has allowed them to remain friends and see each other frequently, there are thousands of people on both sides of the border who long and yearn to see the people and places they once loved and knew as home but have been unable to see for over 60 years due to cruel visa regimes and heartless politicians who drive wedges deeper and wider between India and Pakistan for personal gain. According to a report in the Guardian , the two tennis players want to play a tennis match at Wagah, the border separating India and Pakistan. The border will serve as the net. 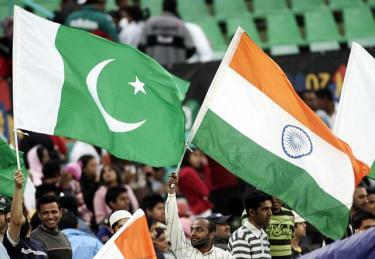 Aisam will play on the Indian side and Rohan will play on the Pakistani side of the border. I want very much for the two to win the Quarter-Finals at Wimbledon, but maybe even more than that I want to see them playing at Wagah Border Crossing! The tennis stars are trying to turn this fantastic idea into reality. And at this point in time, I think that is exactly what the two countries need. Their performance at Wimbledon and the recent positive vibes coming from the governments as well as civil society in both India and Pakistan makes this a very good time to pursue this idea. I don’t know much about tennis but I really want this match to happen! I will go to watch. And I promise to read up everything I can and ask anyone I can to help me understand the game better so I am prepared to watch the war of tennis at the border. And I’m sure a lot of other Pakistanis will too. As will many Indians. We all love a little bit of healthy competition with the Indians! I don’t know how one goes about organizing a tennis match at an international border. But I wish I knew how to do it. So if any of you have ideas, please help. I would like to see some Indo-Pak tennis and also some regional peace and good will. And while I watch this match, I will put aside my intensely competitive patriotic feelings and cheer loudly for Rahul Bopanna. So Rohan, you try to make this tennis match happen – and we the 170 million people of Pakistan will cheer you on with all our might!